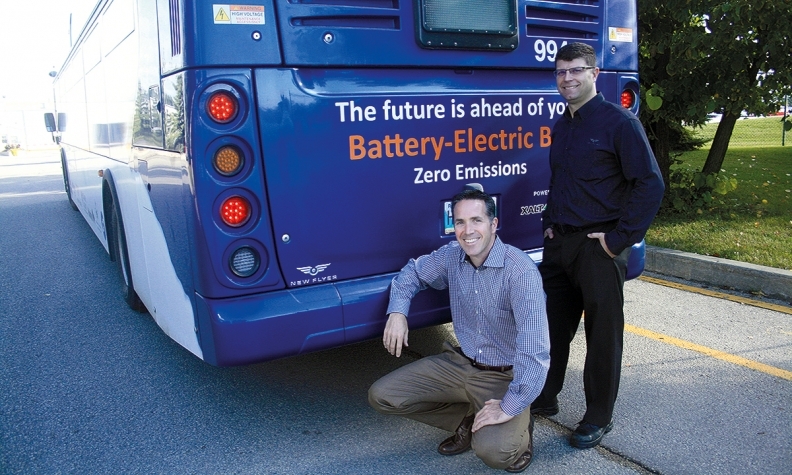 New Flyer Industries Vice-President of Engineering Chris Stoddart (left) and Director of New Product Development Thomas Small with one of the company's buses. Winnipeg’s New Flyer Industries may be on top of North America’s bus manufacturing sector now, but Chris Stoddart, vice-president of engineering, knows staying ahead of future trends is the only way to stay there. So for a look into the future of personal mobility, taking a look at what’s on his desk and in his mind now isn’t a bad place to start. But looking forward, Stoddart and his team are already investigating aspects of autonomous driving to integrate into buses. “There’s no doubt a significant part of our technology roadmap will involve adding semi-autonomous features to buses,” he said. He says the first steps will most likely mirror what has been happening with cars, with technology such as lane-departure warning and steering assistance, as well as emergency braking. Full autonomy might be on the radar, but he says it’s just a blip on the horizon today. More interesting might be his early thoughts on the so-called multi-mode transportation, where a commute might involve two, three or more types of vehicles: a bike to a bus hub, then a bus to a train hub and possibly Uber or Lyft ride-hailing services for the last mile. It’s a big part of what Ford and General Motors are looking at as they plan to blow up their business models. Stoddart envisions an app that links various forms of transportation from various providers to create a cohesive itinerary. “You’ll want to be able to look at your smartphone and see the bus will arrive in 10 minutes, will arrive at the train station 15 minutes before the train departs and then the train arrives at 9:30 a.m., so can Uber pick me up then?” he said. It’s a nifty concept, but invokes memories of protocol battles such as VHS vs. Beta or High-definition Disc vs. Blu-Ray. Fortunately, the various providers of transit vehicles have come together already on other protocols, such as for charging stations and connectors. Hydrogen-fuel-cell technology has evolved to the point fuel cells for buses operate now much like the internal-combustion engine in the Chevrolet Volt: all of the energy for the electric motors comes from batteries, with the fuel cell acting as a range-extender by creating electricity for the batteries. Stoddart said that the thinking behind the Volt could be the next frontier in electric buses. Using a range-extender, perhaps a 2.0-litre four-cylinder gasoline engine to recharge batteries, is a promising way to answer questions about range. An interesting test under way now in Winnipeg — the “opportunity charging” example — involves a battery-electric bus running on a 40-kilometre loop. At the airport, the bus drives under an overhead charging station where a roof-mounted device raises automatically to connect with three electric terminals. The bus recharges in 10 minutes as part of its regularly scheduled layover at the airport.